The orthogonal frequency division multiple access (OFDMA) scheme has been selected as a potential candidate for many emerging broadband wireless access standards. In this paper, a new joint scheduling and resource allocation scheme is proposed for the OFDMA systems using contiguous subcarrier permutation. The proposed resource allocation algorithm provides contiguous sets of frequency-time resource units following a rectangular shape yielding a reduction on the required burst signalling. The joint scheduling and resource allocation process is divided into two phases: the QoS requirements fulfilment and the input buffers emptying status. For each phase, a specific prioritization function is defined in order to obtain a trade-off between the fairness and the spectral efficiency maximization. The new prioritization scheme provides a reduction of 50% of the 99th percentile from the delivered packets delay in case of non real-time services, and 30% of the packet loss rate in case of real-time services compared to the proportional fair scheduling function. On the other hand, it is also demonstrated that using the rectangular data packing algorithm, the number of required bursts per frame can be reduced up to a few tenths without compromising the performance. The forthcoming 4th generation (4G) wireless networks are expected to support high data rates (i.e., spectral efficiencies from 10 to 20 bits/s/Hz are required) and high amounts of simultaneous users, especially in the downlink communication mode . Recently, the major 3G standardization bodies, that is, the 3G Partnership Project (3GPP) and the 3GPP2, have defined the orthogonal frequency division multiple access (OFDMA) scheme as the dominant physical layer (PHY) communication technology. As the early stages of 4G wireless networking unfold, system developers are beginning to consider the OFDMA solution as the best suited for WiMAX (IEEE 802.16e/m)  systems and other multicarrier-based equipment (e.g., 3G-LTE, VSF-OFCDM from NTT-DoCoMo, or FLASH-OFDM from Qualcomm) [3, 4]. The OFDMA technique efficiently combines discrete multicarrier modulation with frequency division multiple access. The advantages of OFDMA include the flexibility in subcarrier allocation, the absence of multiuser interference due to subcarrier orthogonality, and the simplicity of the receiver among others. In current OFDMA systems like IEEE 802.16e, the subcarriers are grouped into larger units referred to as subchannels ‎. Then, these subchannels are grouped into bursts, where each burst is mapped to one user (in unicast) or a group of users (in broadcast). The burst allocation and the modulation and coding scheme (MCS) applied to each burst are adapted on a frame basis. This allows the base station (BS) to dynamically adjust the bandwidth usage per user according to the users' requirements, that is, the quality of service and the users' current channel state. Scheduling policies based on weighted fair queuing techniques have been designed to balance the system throughput and fairness among users . One of the most popular scheduling policies, currently used in the 3G networks, is the proportional fair scheduler (PFS) [6–8]. In each radio resource unit, the PFS assigns each user a priority that is proportional to the channel quality and inversely proportional to the offered data rate. However, the main drawback of PFS comes from the fact that it considers full buffers and constant bit rate (CBR) streams. Clearly, multimedia networks have to deal with different traffic types, for example, variable bit rate (VBR) streams with very strict packet delay requirements. Recent trends in packet scheduling consider cross-layer implementations such as those proposed in [9–11]. Liu et al. proposed in  a scheduling algorithm where a priority is assigned to each user according to its instantaneous channel and service status. The channel state is obtained directly from the average received signal-to-noise ratio (SNR), and the service status is obtained from the delay of the head-of-line packet. The same principle is extended to the OFDMA system in , where the priorities are also assigned as a function of the subchannel index. Furthermore, Jeong et al. in  proposed to prioritize the packets according to the so-called "emergency factor'' which is the ratio between the packet delay and the maximum delay constraint. Therefore users with higher emergency factor are scheduled first. However, no one of those proposals has considered the effects of the resource allocation regarding the required signalling and its payload neither the need of rectangular shaped bursts. Each burst is signalled at least by its position in the frame (starting subcarrier and symbol, and in Figure 1), the number of allocated MRUs in frequency and time ( and ), the MCS, and (optionally) the associated service flow or connection identifier (SFID/CID) . Table 1 resumes the fields that are transmitted for each burst. In this proposal, we define one burst as a set of continuous minimum resource units (MRUs) (logical or physical) in both time and frequency domains following a rectangular shape containing data from one service flow. Each service flow is a unidirectional stream of packets with a particular set of QoS parameters . Ben-Shimol et al. proposed in  to allocate the resources following a "raster approach'' to fit the resources into a rectangular shaped burst such that the resources are allocated first in frequency direction and later in time direction (see Figure 1). Another algorithm that minimizes the number of bursts given the amount of resources allocated to each user has been proposed by Erta et al. in . However, the works in [12, 13] have been conceived considering that the channel within each subchannel is uncorrelated among subcarriers (thus a subcarrier permutation algorithm is assumed); thus the number of MRUs allocated to each user can be determined a priori according to the average SNR. Though these proposals may achieve a good tradeoff between complexity and spectral efficiency, the gain from frequency scheduling (and multiuser diversity) is minimized since the channel effects have been averaged through all the bandwidth. Signalling data per burst used in the DL-MAP. IEEE 802. 16e OFDMA frame in TDD mode and burst structure. In this paper, a new dynamic radio resource management scheme considering the rectangular burst shape required for the IEEE 802.16e frames is presented. The proposed algorithm, which can be used indistinctly in case of correlated or uncorrelated channels per subchannel, jointly performs packet scheduling, resource allocation as well as adaptive modulation and coding (AMC) when uniform power allocation is applied. The main contributions from this paper are (i) a new resource allocation algorithm which reduces the number of bursts per frame by allocating continuous MRUs, hence reducing the required signaling per frame, and (ii) a new prioritization function which allocates the resources in a fair fashion as the PFS. In order to assess the performance of the proposed scheduler (which is able to cope with maximum packet delays and VBR streams) different performance analyses are provided where the PFS is also studied and compared. The paper focuses on the downlink communication mode based on IEEE 802.16e system parameters. However, it can be also applied to any other OFDMA-based scheme. Furthermore, since the user's data are in almost all the cases packed together in the time and/or the frequency domain, the mobile stations (MSs) power consumption is also reduced due to the reduced number of active symbols (shorter connection in time) or the reduced number of active subchannels (lower computational cost at the receiver) . The rest of the paper is organized as follows. In Section 2 the system model considered is described. The proposed radio resource management scheme is then studied in depth in Section 3. Afterwards, the performance of the proposal is shown in Section 4 obtained over extensive computer simulations. Finally, some conclusions are drawn in Section 5, where the benefits and the drawbacks of the overall approach are stood out and summarized. We consider in this proposal the downlink mode in the IEEE 802.16e PMP (point-to-multipoint) system with one single cell with a total of K MSs within its cell area with no interference sources. We consider only the time division duplexing (TDD) scheme; thus channel reciprocity can be assumed between uplink and downlink. The whole TDD frame is formed by a total of symbols with duration. The number of downlink and uplink OFDM symbols usually follows the ratio or ; however, it can be adjusted by the BS according to users' demand ‎. The whole transmission bandwidth BW is formed by a total of subcarriers where only are active. The active subcarriers include both the pilot subcarriers and the data subcarriers which will be mapped over different subchannels according to the specific subcarrier permutation scheme . For the full usage of subcarriers (FUSC), pilot subcarriers are allocated first and the remainder subcarriers are grouped into subchannels where the data subcarriers are mapped. On the other hand, the partial usage of subcarriers (PUSC) and the adjacent subcarrier permutation (usually referred as Band AMC) map all the pilots and data subcarriers to the subchannels, and therefore each subchannel contains its own set of pilot subcarriers. For the FUSC and PUSC, the subcarriers assigned to each subchannel are distant in frequency, whereas for the Band AMC the subcarriers from one subchannel are adjacent. Note that the FUSC and PUSC increase the frequency diversity and average the interference, whereas the Band AMC mapping mode is more convenient for loading and beamforming where multiuser diversity is increased . 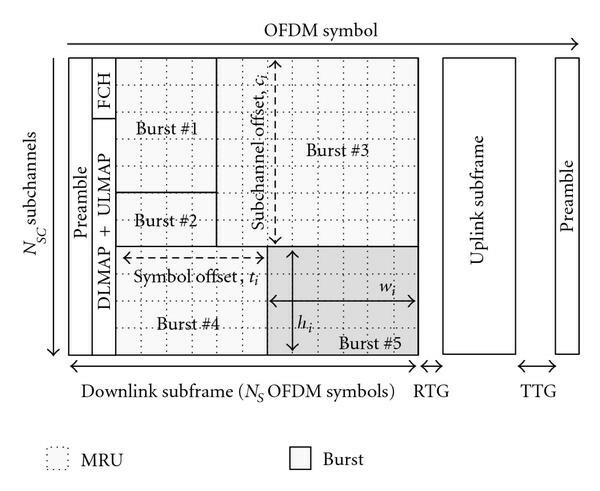 As it is depicted in Figure 1, the MRUs allocated to any data stream within an OFDMA frame have a two-dimensional shape constructed by at least one subchannel and one OFDM symbol. In the IEEE 802.16e standard the specific size of the MRU varies according to the permutation scheme; concretely for the Band AMC it may take the shapes , , or (subcarriers time symbols, resp. ), where 1/9 of the subcarriers are dedicated to pilots. We define an MRU as a resource unit formed by a set of symbols in frequency and time domains, respectively. Once the size of the MRUs is defined we can obtain the total number of MRUs per frame , where is the number of subchannels and defines the number of the time slots. Several MRUs may be grouped into a data region or burst (see Figure 1), formed by successive MRUs in frequency and in time directions. Both the MRU and the data region always follow a rectangular shape structure. We consider the case that the transmitted data in each burst belongs to only one service flow (i.e., to a single MS), and the MCS applied to each burst might be adapted. Since the MS receiver needs to know how the downlink frame is organized in order to properly decode the data, the downlink control channel includes the number of bursts transmitted as well as the signalling for each burst. In the IEEE 802.16e each burst is signalled by the parameters indicated in Table 1. Multicast transmission is addressed by mapping different connection identifiers (CIDs) to each burst, where the BS is responsible for issuing the service flow identifiers (SFIDs) and mapping it to single CIDs. As it is shown in Figure 1, the signalling bits described in Table 1 are those used into the DL-MAP structure and transmitted at the beginning of each frame after the synchronization preamble and the frame control header (FCH) . One of the main goals of the radio resource management function is to maximize the spectral efficiency. This is performed at the BS by the radio resource agent and by the radio resource controller which can be implemented apart from the BS. The tasks performed include the channel estimation, the channel quality indicators management, and the control of the radio resources assigned to the BS. Since most of the tasks related to resource allocation and scheduling are not defined in the 802.16.a/e standards, each operator or system developer can tune and optimize its network according to collected performances and metrics . In Figure 2, the protocol stack according to the IEEE 802.16e standard is depicted. As it was previously mentioned, only the medium access controller (MAC) layer and the physical (PHY) layer are defined within the standard . This work will focus at the MAC layer blocks which perform the resource allocation and scheduling procedures and those implied blocks (i.e., the input queuing buffers), the packet data unit (PDU) management and fragmentation, and the burst mapping. Therefore, all blocks within the dotted line shaded shape are affected by the current proposal. On the other hand, the air link control (ALC) is in charge of recollecting the MS's channel state information which is later used by the scheduling and resource allocation processes as well as other procedures such as the power control or the ranging among others. Protocol stack at the BS and layers interaction. best effort (BE) class: designed to support a data transmission when no minimum service level is required. where would be the SNR that, in case of an additive white Gaussian noise (AWGN) channel, would give the same bit error rate (BER). Several metrics as the exponentially effective SNR (EESM) ‎, the mean instantaneous capacity (MIC), or others based on the mutual information per bit can be applied to obtain the [15, 17]. In our proposal, the harmonic mean of the channel values has been used as proposed in , which gives a tight lower bound of the BER and is independent of the MCS. Next subsections describe the scheduling and resource allocation algorithms presented in this paper. The main goal of the resource allocation and scheduling mechanisms is to maximize the system throughput (i.e., the spectral efficiency) while guaranteeing the QoS constraints for each SF. Actually, most of these constraints are defined by the average bit rate, the peak bit rate, the minimum bit rate, the maximum tolerated delay per packet (and jitter), and the average bit error rate (or packet error rate). Nevertheless, one key issue for any resource allocation scheme is to minimize the signalling that is required to inform the receivers how the frame is structured. Following the IEEE 802.16e transmission format, since each burst requires a specific signalling, it is suitable that all the scheduled packets belonging to the same SF are transmitted within the minimum number of bursts hence the signalling is minimized. Equation (4) guarantees that the different bursts do not overlap (as seen in Figure 1). Finally, (5) and (6) determine the actual number of bits transmitted within the th burst . The term represents the upper layer throughput (in bits) per MRU, and it is obtained as a function of the calculated per each burst, the available MCS, and the upper bound BER. The resolution of (2) to (6) might be obtained using nonlinear programming techniques. However, such techniques are not feasible for practical systems due to prohibitive computational complexity. Furthermore, the problem as defined from (2) to (6) is very rigid since it forces the number of bursts to be equal to the number of services flows, and in consequence all service flows are scheduled during each frame. However, the optimum number of bursts, should be adapted to the different channel conditions (an MS may experience deep fading during certain frames). In addition, using a unique burst per user may decrease the spectral efficiency when the burst spans over a large bandwidth due to the effect of frequency selective fadings. To overcome these limitations, the authors propose a low complexity iterative algorithm that adapts the number of bursts for user scheduling and resource allocation purposes . In order to maximize the spectral efficiency and undertaking the service flows QoS requirements, the resource allocation and the rate adaptation problem is described in Section 3. A is divided into two stages: the minimum requirements fulfilment and the spectral efficiency maximization. For each stage a different prioritization function is applied. where takes the minimum value of and . The term in (11) means the minimum number of bits that should be transmitted in the actual frame in order to achieve a delay for each packet , where is a guard time. is a normalization factor which is the maximum number of bits that could be transmitted within a frame using the highest MCS. Furthermore, in case any packet from the th SF is close to exceed its maximum delay the term is substituted by an urgency factor , which boosts the data transfer from the th SF . Analogously, the packet that is close to achieve the maximum delay is entirely considered for transmission in the current frame by including the whole packet in . The value of might be different for each class of service (i.e., for the UGS and rtPS type, for the nrtPS, otherwise ). Actually, those classes of service whose packets are susceptible of being dropped in case of excessive delay should be prioritized. Furthermore, notice that in case an SF has not been allocated the minimum resources during the current allocation process, its priority in the next frame will be automatically increased. Finally, in case a buffer is empty the priority given to that SF is zero. Once the priority for each SF over each subchannel and the minimum bits per frame have been obtained, the MRUs are allocated iteratively in order to guarantee the QoS of all SFs (their minimum required bits per frame). 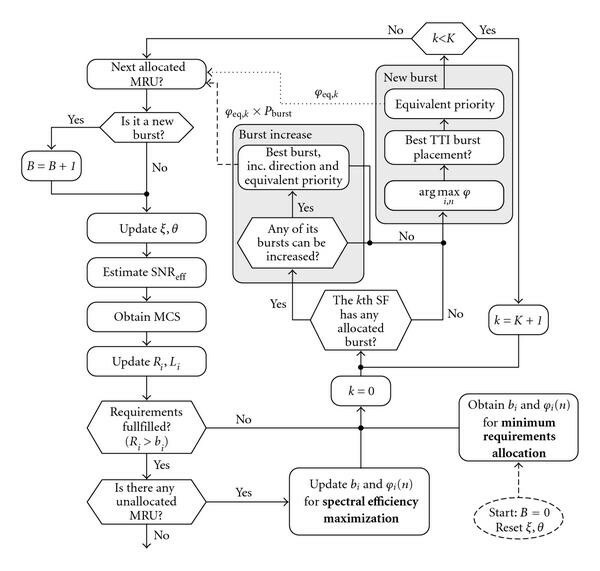 The flowchart of the proposed algorithm is shown in Figure 4. Two cases are considered during each iteration: (i) a new burst might be created and (ii) an already existing burst might be increased by allocating another MRU (or a group of) to the burst. In the second case, when one MRU is allocated to an existing burst no extra signaling is required; however, the enlargement of the burst may lead to a reduction on the MCS level. As it can be observed in Figure 3, each burst may be increased towards four directions, that is, top, bottom, left, and right with respect to its position in the frame. In order to determine in which direction the increase is more advantageous or suitable, an equivalent priority is assigned to each direction (as indicated in Figure 3) where is obtained by averaging the priority values of the MRU that are covered by the enlarged burst. Whether in the direction there is any occupied MRU or the burst is at the frame boundary then is forced to 0. An example of the increasing principle is shown in Figure 3 where the numbers inside the rectangles indicate the order in which the resources have been allocated to each burst. In this example, three bursts have been created after 15 iterations, where the number indicated inside each MRU indicates the order in which the MRUs have been allocated. Note that as the burst increases more MRUs are allocated per iteration and as consequence, the resource allocation process is accelerated. Burst increase options and example of bursts increments after 15 iterations. Resource allocation and scheduling algorithm flowchart. 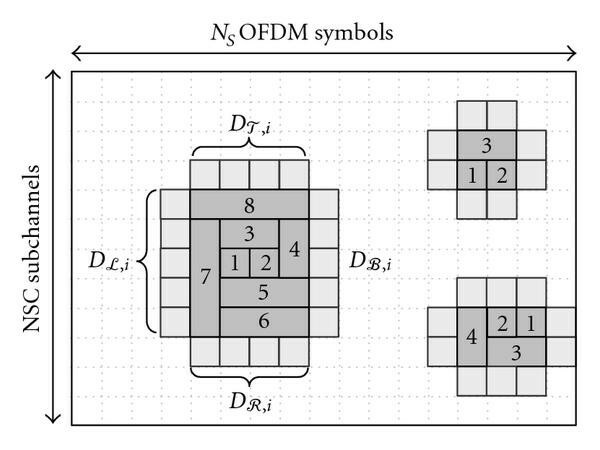 The algorithm, depicted in Figure 4, starts without any allocated burst ( ). For the first burst, the th MRU is allocated according to the th service flow and the th subchannel combination that maximizes the value of . The position on the time axis of the MRU allocated to the first burst is forced to . Once the first burst is created, the iterative process starts checking the possible increments of the already existing bursts while at the same time it tries to the generate new bursts. Iteratively, the option with the highest priority is allocated a new MRU (in case of creating a new burst) or a group of MRUs (in case of enlarging an existing burst). In case a new burst is created It has been stated before that is time independent (the channel is assumed constant for each subcarrier during the whole frame). As a result, in case a new burst is assigned to one subchannel, it position in the time axis is determined by that position which maximizes the distance to other already allocated MRUs. This in fact assures that the new created burst has higher chances to be increased than whether it is placed near to the other already created bursts. Nevertheless, in order to achieve the lowest number of bursts, the equivalent priorities associated to each burst increment are multiplied by a factor (e.g., ) to push forward the enlargement of the existing bursts instead of generating new ones. The algorithm is then iterated until all the requirements are fulfilled or when all the resources have been allocated. The number of bursts is not fixed and may change from frame to frame depending on the buffers state, the QoS requirements, and the channel state conditions. Moreover, since each SF may have more than one burst, another auxiliary matrix θ with size is defined. Each value of θ indicates to which burst the MRU is allocated. Both matrices and θ are updated each time a new MRU is allocated. Finally, the end of the joint scheduling and resource allocation process may be achieved due to two main indicators: (i) all the MRUs have been allocated, or (ii) the input buffers have been emptied. The number of allocated bits to each SF will be then determined by the number of bursts associated to such SF and the MCS of each burst. Since the packets must be received in the correct order, the data from the buffers is extracted from older packets to newer packets (as in a first-in first-out queue). The delivered packet delay is then measured as the time since the packet is queued at the buffer until the instant where all the bits from the packet have been transmitted. The simulated scenario is focused on a single cell system environment having the main system parameters detailed in Table 3. The simulation environment has been carried out using a developed simulator using and communication libraries. The simulator includes both the link level and the system level properties where both the MAC and the PHY properties of the WiMAX system are considered (see Table 1 parameters). During each simulation run, the users are dropped at different positions following a uniform distribution within the cell area. The position of the MSs remains fixed during the whole simulation process while the speed of each MS is only employed to determine the Doppler effect and the channel coherence time . A simulation time analysis of 50 seconds is considered to be enough to ensure the convergence of the service flows and the performance metrics. The full process is repeated with the MSs dropped at new random locations. The number of simulated drops is 25, which makes the results independent of the users' position. Without loss of generality but to simplify the results, a single SF is assigned to each user. The channel estimation is assumed ideal at the base station, and packet retransmission is not considered. Five service classes, summarized in Table 3, have been considered according to the traffic models in [17, 19]. For the rtPS and nrtPS the flows are generated as variable size packets generated periodically (each 100 milliseconds) according to the video conference and multimedia streaming models in . For the UGS packets are of fixed size and periodically generated (e.g., VoIP). Finally the web browsing and file transferring protocols are modelled as asynchronous process that generate variable size packets following the models described in . The packets from each SF are buffered at independent queues where each packet is monitorized by its size in bits and the time it has spent at the buffer. A maximum BER after channel coding is required from all the service classes. In this case, the minimum effective SNR per MCS with the mandatory punctured convolutional coding defined in the IEEE 802.16e standard  (constraint length 7 and native code rate 1/2) are the following: [7, 8.7, 9.6, 11.2] for QPSK, [13.9, 15.6, 16.6, 18] for 16QAM, and [20, 21.7, 22.7, 24.3] for 64QAM with coding rates of 1/2, 2/3, 3/4, and 5/6, respectively. To obtain the effective SNR the channel values inside each subchannel are merged by the harmonic mean which despite of being a very simple mean calculation form independent of the modulation and coding, it is able to extract very accurately the effective channel . First, the performance of the proposed TSPS prioritization function is evaluated and compared to the PFS and the prioritization functions by means of the cumulative density function (cdf) of the delay from the delivered packets (see  for more information on the measurement procedure). The allocation algorithm follows the one proposed in Section 3 with . For the PFS and b2PFS scheduling functions, the number of bits per frame that should be transmitted is equal to the number of buffered bits . The latency scale for both the PFS and the b2PFS is fixed to 10 frames (i.e., ). Then, the packet delay statistics obtained with the different scheduling functions in case of nrtPS traffic are depicted in Figure 5, where the number of MSs within the cell is . The traffic from all the users is modelled according to  as VBR streams with an average data rate of 2 Mbps (an average system throughput of 30 Mbps is then required). The maximum allowed delay per packet is 300 milliseconds. 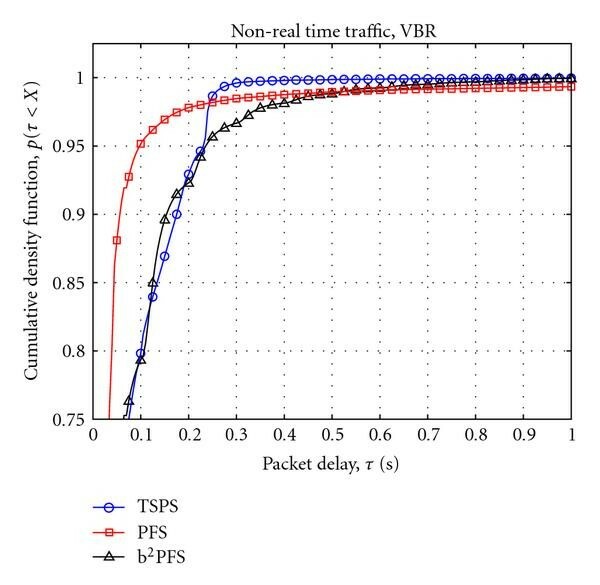 The 99th percentile of the delivered packets delay measured using each prioritization function is 275 milliseconds for TSPS, 535 milliseconds for PFS, and 530 milliseconds for the . Nevertheless, for the TSPS scheduler the improvement due to the urgency factor ( ) is clearly appreciated since the slope of the cdf is changed for delays higher than the value , where the guard time was fixed to . Furthermore, we can also observe that the maximum delay of the b2PFS scheme is much lower than for the PFS. This difference in performance comes from the fact that the considers the states of the buffers, thus when a large packet is received the priority for that queue is increased until all the buffers have similar number of queued bits. On the other hand, the PFS is designed to balance the throughput from all the users during short periods of time. Using the same configuration with and the same average bit rate equal to 2 Mbps, we have observed that for CBR traffic, the 99th percentile is obtained at 55 milliseconds, 100 milliseconds, and 125 milliseconds for TSPS, PFS, and b2PFS, respectively, giving the scheme better performance than the PFS for VBR traffic as it was expected. Cumulative density function of the packet delay for nonreal-time traffic and users. In case of rtPS traffic, each user stream is modelled also as a VBR with an average bit rate of 380 Kbps. For the rtPS traffic, in case of having a packet not transmitted within the maximum delay, the packet is deleted from the queue and discarded. 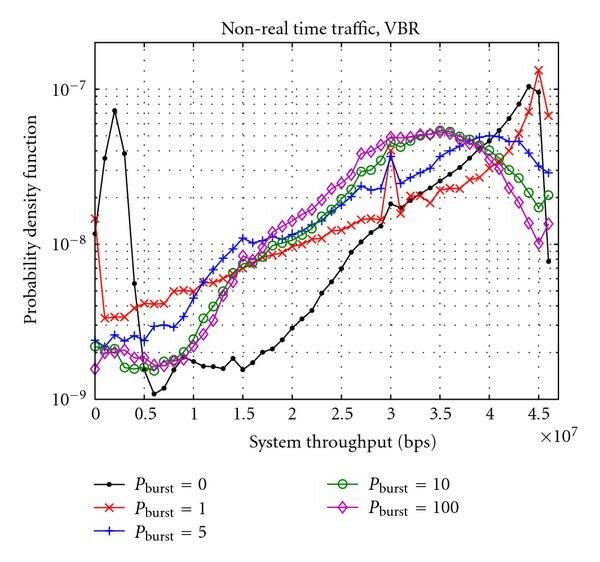 For this case, two parameters have been analyzed: the delivered packets' delay statistics and the packet loss rate (i.e., number of delivered packets divided by the number of queued packets). Figure 6 shows the cdf of the packet delay for this scenario having 50 and 100 users. As it is shown in Figure 5, for all the prioritization schemes achieve a delay lower than the maximum ( milliseconds); in fact, the 99th percentile measured over is 25 milliseconds for TSPS and PFS, and 15 milliseconds for the . Furthermore, the packet loss rate for each scheme is 0% for the TSPS, for the PFS, and for the . 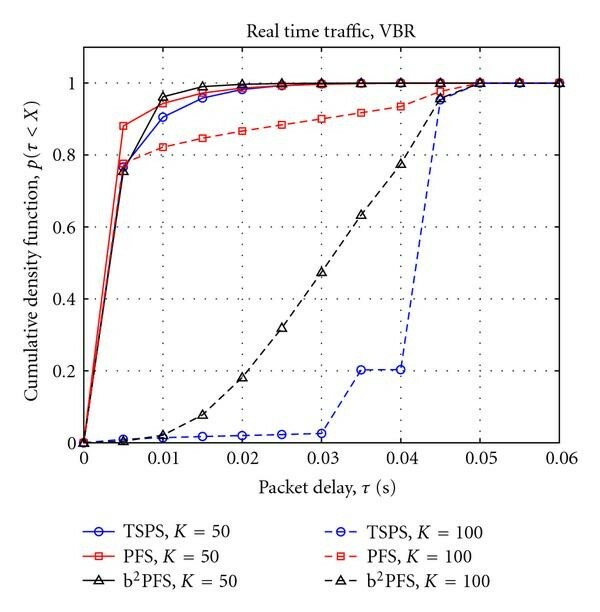 In case it can be observed that the PFS is the only one that achieves lower packet delays, whereas the TSPS sent most of the packets when the urgency factor was active (the urgency factor is applied when ). For , the packet loss rate for each scheduling function is 8.98%, 33.4%, and 16.97% for the TSPS, the PFS, and the , respectively. Note that for the TSPS although most of the packets are sent when they are nearly to expire, it achieves a lower packet loss rate. Cumulative density function of the packet delay for real-time traffic and users. So, despite the TSPS initially implies an increase on the computational complexity since it requires more information about the buffers status (i.e., each packet must be time stamped for the TSPS scheduler), its superiority has been shown for real-time and nonreal-time applications. Moreover, there is no necessity to update the priorities each time an MRU is allocated; thus, the computational complexity is also drastically reduced compared to the PFS and the . Another advantage from the TSPS is that it can easily manage different traffic types by applying different maximum delay bounds to each stream. In Figure 7 the performance of the TSPS over heterogeneous traffics is shown. In this scenario where 10 users require nrtPS, 13 users require rtPS, 10 users are browsing internet files (World Wide Web (www) service), 5 are downloading files according with the file transfer protocol (FTP), and 12 users demand UGS connections for applications such as Voice over IP. The total measured downlink throughput is 26.54 Mbps, and the maximum delay for each service is based on what is indicated in Table 2. For the www and the FTP services, despite there is no delay restriction (i.e., ∞), a maximum delay of seconds and seconds has been assumed for both services, respectively; thus, the performance of each can be better appreciated. 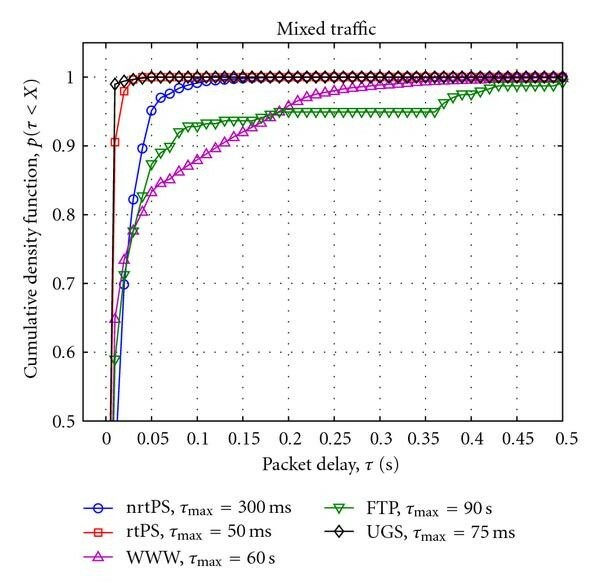 It is clearly depicted in Figure 7 that each traffic type achieves a maximum packet delay lower than the maximum tolerated. The 99th percentile for the delay sensitive applications is at 95 milliseconds, 25 milliseconds, and 15 milliseconds for the nrtPS, the rtPS, and the UGS, respectively. Note that the UGS achieves lower delay than that obtained for rtPS despite having a higher packet delay value. This is justified by the fact that the packets of the UGS service are much smaller than those from the rtPS; thus, fragmentation is not applied in most cases. Parameters of the simulated classes of service. distance BS to MS in Km. Cumulative density function of the packet delay for mixed traffic obtained with the TSPS scheduling function and users. Having illustrated the advantages of the proposed TSPS prioritization function, the following figures depict the performance of the authors' proposed resource allocation algorithm described in Figure 4. In Figure 8, the statistics (by means of the probability density function (pdf)) related with the number of bursts per frame following the proposed algorithm are shown. The considered scenario is formed by users, each requiring nrtPS services. The number of bursts per frame is here analyzed as a function of the factor having values . The prioritization function within the proposed TSPS is here applied. In case , the algorithm considers that each new allocated MRU is a new burst. Thus this is the maximum granularity case, but clearly in this extreme case the signalling is unaffordable. It can be observed in Figure 8, how for , the algorithm starts to merge the MRUs into bursts. For , during the allocation of each MRU, half of them are allocated to an existing burst (both new bursts and existing bursts have the same priority). It is observed that the number of bursts for is still unaffordable in terms of required signalling. However, it is shown that for the number of bursts is lower than 60 for all the simulated frames. Furthermore, in case , the achieved number of bursts per frame is lower than 24 in 99% of the transmitted frames, which can be considered as a very encouraging result. Furthermore, a soft limiter can be included to the algorithm to limit the maximum number of bursts per frame up to 20 without too much affecting the spectral efficiency. Therefore, assuming that approximately 60 bits are required for signaling each burst ‎ and using a QPSK modulation with a code rate 1/3, the downlink signaling zone (i.e., the DL-MAP) would span less than 2 OFDM symbols. Hence, the loss due to the downlink signaling is 6.66% for the downlink mode when having a total of 30 OFDM symbols per subframe. Probability density function of the number of bursts per frame for nrtPS , users and different values of the factor (when the TSPS prioritization function is applied). On the other hand, the spectral efficiency obtained by the proposed algorithm defined in Section 3.2 is plotted in Figure 9 as a function of the factor. The simulated scenario is exactly the same as in Figure 8. It is clear that as increases the spectral efficiency decreases. In case , two main behaviors are observed. First, almost the frames sent with a very high spectral efficiency achieve the maximum throughput which is approximately 46 Mbps; however, it can be observed that many frames have been sent quite unfilled due to the lack of buffered bits leading to a low system throughput (peak on the left side of the figure). Furthermore, when computing the 99th percentile of the packet delay for each value, the following delay values have been obtained (millisecond) for , respectively. Clearly, joining these results with those obtained in Figure 8, it can be concluded that having offers the best trade off between granularity (i.e., spectral efficiency), required signalling, and the required QoS. Probability density function of the system throughput for nrtPS , users and different values of the factor (when the TSPS prioritization function is applied). In this paper, a new scheduling prioritization function is proposed as well as a continuous frequency and time resource allocation scheme for OFDMA systems (following the data packing standardized in the IEEE 802.16e) which can be applied with both subcarrier permutation schemes (contiguous or distributed). Moreover, the proposed time stamped packet scheduling (TSPS) scheme has shown to handle sensitive delay applications (i.e., rtPS and nrtPS) while obtaining high spectral efficiencies (multiuser diversity and frequency scheduling are exploited). Actually, a 50% reduction of the 99th percentile from the delivered packets delay and 30% of the packet loss rate (compared to the PFS function) is achieved in case of nrtPS and rtPS streams, respectively. On the other hand, the proposed resource allocation algorithm, which packs users' data into rectangles based on iterative bursts increments, gives an important reduction on the number of required bursts per frame. 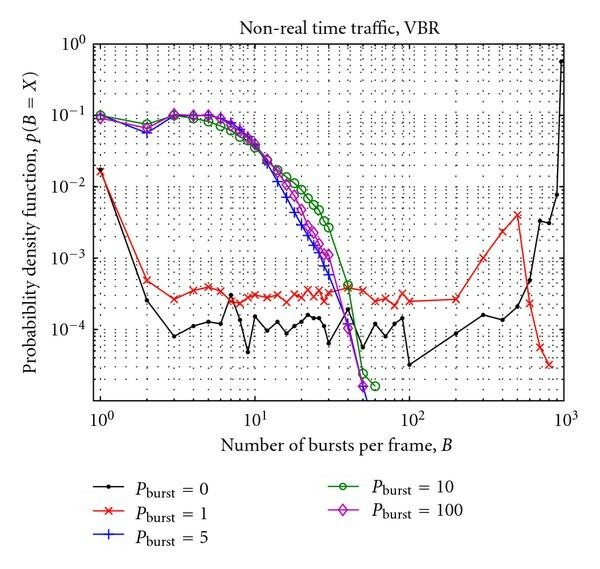 According to the simulations carried out, it is concluded that if the priority associated to increasing an existing burst is five times that of generating new bursts (i.e., ), a signaling loss lower than 10% can be achieved without sacrificing spectral efficiency. Finally, another advantage from the proposed resource allocation algorithm that has been observed during simulations is its lower computational complexity compared to the case where each MRU is independently evaluated. Actually, since in many cases several MRUs might be allocated in a single iteration, the number of required iterations is reduced as the number of bursts per frame is decreased. This work was partially supported by the European ICT-2008-211887 project PHYDYAS.